Home » Dampen Your Water Bill! Boards and property managers are always looking for opportunities to manage costs. Utilities are one area where we have little, if any, influence on rates and must look to consumption reduction as our leverage. LED lighting, low-flow toilets, gas contracts, and high efficiency booster pumps are just some of the recent success stories. I would like to familiarize you with an opportunity PSCC 888 (aka Stonebrook) recently introduced at our building in Mississauga. Like all liquids, water aerates or ‘absorbs’ air when rushed through pipes at high speed. The water entering our buildings from the city’s water main is no exception. In fact, the turbulence causes the water meter to interpret this mixture of water and air as a chargeable commodity. What if you could minimize this air and pay just for the water? Air represents 8% of the (water) volume! Encompass Group markets a flow management device (FMD) called H2minusO which can do just that. As the name suggests, the device acts to minimize the air that would otherwise travel through your water meter and inflate the volume of water you ultimately pay for. Turns out that air represents 8% of the volume! The FMD is installed on the building side of the water meter and literally dampens the turbulence of the water without affecting the building’s water pressure. Depending on current water consumption and the size of the water main, return on investment can range from 6 months to 3 years. At Stonebrook, Encompass performed a free, no obligation water-use analysis and determined that our residents are water “misers” compared to most buildings. With pride, we asked how that would affect our return. Encompass determined that we would have a 2 year return on investment which they were prepared to guarantee. The Board felt this was a smart investment with little risk. Installation took only a few hours to complete and did not even involve an interruption in service as the building is equipped with a bypass system. 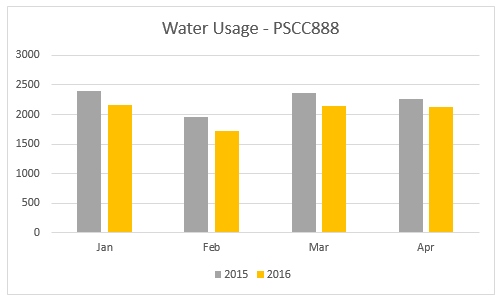 During the first 4 months of 2016 we have experienced a 9% reduction in water consumption (see graph). Gathering 24 months of historical water consumption data. Finding a 4 month period of stable water use for analysis and performance comparison. The filling of swimming pools & cooling towers, garage washing, pipe leaks, and landscape irrigation, are all factors which can confuse the results. Get a guarantee on the savings. Previous post What is Radon Gas?